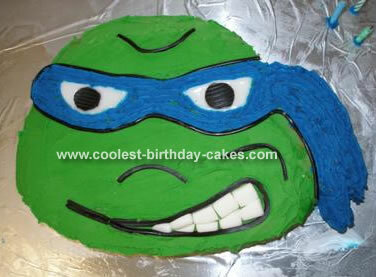 I must admit that a lot of the inspiration for this Leonardo TMTN cake came from the lovely people who had already submitted their photos to this site! I’m not sure I can add any more decorating techniques that haven’t already been mentioned. One that I will give though, is that I used ‘milk bottle’ lollies for his teeth. I simply cut the top off them and them cut them on an angle for when his mouth closes over further.